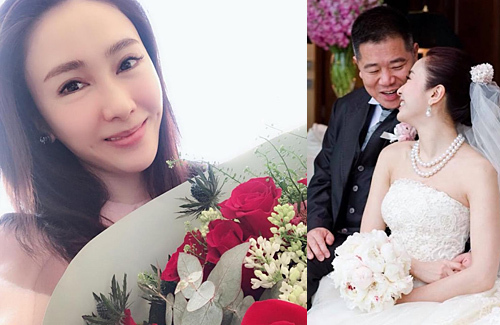 After getting married with businessman Patrick Ma (馬廷強), Gigi Lai (黎姿) retired from acting in 2009. The last decade has yielded to many new beginnings for Gigi, who became a mother of three daughters and the CEO of CosMax, Miricor Enterprises Holdings Limited when her beauty company went public. But Gigi’s best joy comes from her husband, who has supported her through her endeavors and showed that the most precious kind of love can be very simple. Gigi has been growing old gracefully, thanks to the healthy lifestyle she leads which balances career and family life. While Gigi and Patrick maintain a low-profile, Gigi is often all smiles whenever she talks about her marriage and their daughters. So happy for her and her hubby. Love really can be simple! She had him when she needed him. Right timing. Forget about looks. Its the sort of perfect synergy often written about; rich guy marries beautiful girl and are happy. These rich guys usually don’t have the looks. People would be first to complain and not ‘forget about looks’ if rich guy married plain girl. Well said and you know the saying guys like “se” which is beauty and women like “cai” which can mean talent or wealth depending on which character it is. You really wonder if he went bankrupt if Gigi would stay with him or not? Or of Gigi turned ugly, would he stay with her? That would be a true test to their love. @hetieshou Or maybe if he is just a normal guy instead of a businessman to begin with? I highly doubt she is growing old gracefully. Saw some recent photos of her and she is looking very plastic now (in a bad way). Glad to hear she is happy now.